Microsoft has added a raft of updates to its Teams collaboration tool in a bid to win over “first-line” workers such as retail, healthcare and service staffers. The additions include new mobile app functions, integrations with third-party scheduling apps and an employee “praise” tool. Microsoft claims there are more than two billion frontline staff globally – a segment of workers that has received less attention than knowledge workers, who have access to a plethora of digital tools to support workplace communications and productivity. “[First-line workers are] a massive segment of workers around the world that are currently pretty drastically underserved by technology,” said Emma Williams, corporate vice president of Modern Workplace Verticals at Microsoft. The additions to the Teams mobile app, announced today, include location sharing, the ability to record and share audio messages, and a camera module with image annotation. The latter can help protect sensitive data within an organisation, said Williams, providing a more secure alternative to consumer chat apps. “In healthcare, [sending images] is one of the primary forms of communication,” said Williams, with clinicians “sharing x-rays back and forth or pictures of a patient's injuries. So much of this is happening in unsanctioned consumer chat apps, where there is no security, no compliance, and photos get automatically stored on someone's personal cellphone. "[The] secure camera experience [means] that you take the photo within Teams and it only gets shared within Teams." The mobile app is also customisable with role-based policy templates. IT admins can enable or restrict certain functions such as calendars, calling or private chats, for instance, depending on user needs. Employees can also customise the app themselves, with the ability to pin frequently used modules to the app's navigation bar. Other updates include integration with workforce management systems. 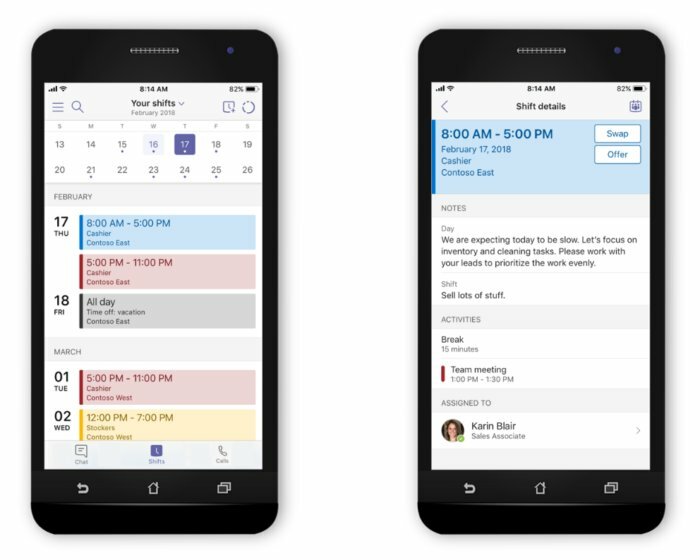 This builds on the launch of Shifts – a lightweight schedule management feature available in Teams and announced at Microsoft Ignite in September. The Graph API for Shifts hooks Teams into enterprise scheduling systems like Kronos, allowing workers and managers to view information around attendance or payroll and benefits, for example, within the mobile app. The Teams mobile app now offers better integration with Shifts. Finally, a new “praise” feature lets managers and executives recognise the work carried out by staff - a factor that can help in industries with high rates of staff churn, such as retail. The new features are available to all Teams users, in all SKUs, except for Teams Free, Microsoft said. The latest changes are another indicator of the evolution of Microsoft's team collaboration platform, which was unveiled in 2016 as a competitor to Slack and largely focused on the needs of information workers. This will help Microsoft differentiate Teams in a crowded collaboration software market, said Angela Ashenden, a principal analyst at CCS Insight. “Having started as a horizontal team collaboration solution, the next step for Microsoft Teams is to identify specific use cases it can address, and deliver tailored, packaged offerings to meet the needs of that audience,” said Ashenden. There are a number of communication and collaboration tools aimed at deskless workers, such as Zinc and Teamwire, while Facebook has targeted its Workplace application at staffers of all types. That said, the most commonly used tools by frontline staff are likely to be consumer apps such as WhatsApp, Facebook Messenger and even text messages. A recent survey from CCS Insights indicates WhatsApp is the most widely-used mobile app in the workplace, more prevalent than mobile versions of team chat apps such as Slack and Teams. That offers an opportunity for Microsoft, said Ashenden, since compliance is a “major concern” for IT teams. “If there’s no business-sanctioned solution in place – one that meets the specific communications needs of this highly mobile and often high-turnover workforce – staff will find their own alternatives, and we see evidence of that in the very high use of consumer-centric tools like WhatsApp in the workplace,” Ashenden said.